This 9mm ammo, manufactured by PMC, is widely regarded as the best quality for price ammunition available. This ammunition is manufactured in South Korea, using state-of-the-art processes and machines, resulting in a product that is reliable, very consistent, and surprisingly affordable. This ammunition is loaded with a traditional FMJ bullet weighing in at 115 grains, which is the lightest common bullet for the 9mm Luger. This ammo also used reloadable boxer primed brass casings, giving an additional value to reloaders. PMC 9mm 115 grain FMJ ammo is ideal for range training, plinking and IDPA competitions. This ammo will have a very similar trajectory and recoil impulse to self defense loads that use a 115 grain bullet, and this lighter bullet will help make the most of micro and sub-compact 9mm pistols. excellent / I've shot over 600 rounds. I HAVE A TACTICAL CLASS COMING SOON SO I WANTED TO BUY SOME AMMO.. I'VE USED P.M.C BEFORE WITH NO ISSUE. I have fired about a box and a half of this stuff and I have not had any issues. It cycles just fine in a Glock 17, I have two and tested it in both. My skill is not good enough to say if it is accurate or not, but all my shots hit the target at ranges up to 25 yards. Some barely. This is a pretty good deal and the ammo was very good. 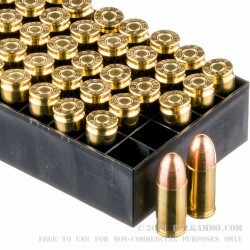 Amazing ammo for great price! They were 100% right! The ordering process, the delivery within 2 days, and the total cost per round was far less costly than what I could find in the Orlando, FL area. Awesome experience, will order from again! Ordered 1000 rounds of 9mm Ammo by PMC 115gr FMJ. Great price, and service. This ammo is great for practice at the range. Buying it from Bulk Ammo was a great experience, and the pricing makes it affordable to shoot. I would buy this ammo again. 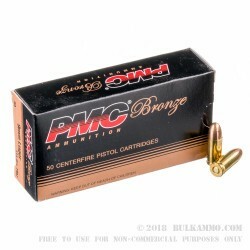 I ordered 1000 rounds of PMC Bronze from bulk ammo a few weeks ago and paid the extra few cents for overboxing. My order arrived in much less time than I had expected. Overboxing was probably unnecessary but for the price I will apply it to every order. My order was delivered in perfect condition and thus far I have seen zero malfunctions from the PMC Bronze after 400 rounds fired. I ordered 1000 rounds of PMC 9mm Luger from Bulk Ammo. I spent the extra few cents for overboxing. My ammo was delivered in a timely fashion and in perfect condition. Having now shot about 450 rounds of the PMC I highly recommend it for target practice at the range. shot over three hundred rounds with no issues. PMC ammo is a top-notch ammo. Excellent ammunition at bargain price. First few boxes ran great out of my PPQ. No problems at all, will definitely buy more PMC for practice rounds. in bulk in all of my calibers at once is so convenient. Easy website to shop on also. This is semi great ammo. Just a note to say thanks for the excellent shipping logistics you have in place. I placed my order for 1,000 rounds of 9mm PMC ammo over the weekend. It was processed Monday morning, and was shipped via Fed Ex by the end of day on Monday. I received the order around 12 noon today (Wednesday)! That's 2.5 days from processing to receiving the order (from western Tennessee to eastern Virginia)! Not only do I appreciate your great prices, but your excellent customer service (as evidenced by your quality processing and shipping operations) is also very much appreciated! Count me in for a lot of future orders! Great ammo for the money. You can spend more but won't get any better performance in an FMJ round. Our Glock 17, 19 and 34 will spit em out for days and I don't ever remember any FTF's or FTE's with this ammo. Great ammo, service and price. Great product, great price, great reliability. Zero issues with payment and prompt shipment. Great AMMO... Customer Service...Quick Delivery... what more do you need!!! Teriffic ammo. No misfires. Clean and well packaged. Arrived sooner than expected. Shot 200 rounds and no problems. Good Target Ammo for the Price! I have shot a lot of this PMC 9mm ammo and always had good performance! I have put it through my Beretta Px4 Storm and my 92FS. Posting a review mostly to give BulkAmmo service a gold star. The package was sent quickly and boxed the way I wanted. I live in an area where a box of ammo could easily get stolen, and the delivery was done right. Well - my previous review was not exemplary! My sweetie's new FNH-9 required a little "polishing" of the ramp and surrounding metal . . . that being done, I recant my previous review of the PMC 9mm ammo. Since I applied a 600 grit followed with a 6000 grit polishing procedure . . . this ammo has performed flawlessly!! I have never bought high volume rounds, I keep up 150 to 250 rounds every two weeks, I call it my 401K trying to keep a stock pile. I have fired over 250 rounds with no problems and my navy seal friend asked were I was finding ammo. We shoot every month, he takes me through combat situations and I supply the ammo, it is a great combo. He is now ordering through this site and very happy. Thanks to bulk for all the ammo. They actually put one of my orders on hold because I ordered form a different IP address and the mailing address was different, they were protecting me from credit card fraud THANK YOU GUYS! It was me just ordered from girls friends wireless and they saw something that didn't add up! AWESOME SITE! I purchased this ammunition and when my wife fired this ammo through her new FNS-9, we had experienced 6 incidences of failure to feed (stove-pipe) within the 1st 25 rounds. I have to admit that there may have been some operator issue here; "limp wrist" syndrome and possibly elbow breaks due to improper technique which I have been told could contribute to this type of feed problem. The ammo ejects perfectly but tends to feed poorly. When we tried other brands, this did not happen so I am wondering if there may be a "batch problem"; also when I fired the weapon there was only 2 instances of miss-feed and I correlated it to my purposefully breaking elbow, and loose wrist grip on the weapon - I still wonder if there is a chance that this batch ( Lot 9A-1068) may be slightly underpowered. I ope not 'cause I gots 1000 rounds!! At the time of purchase, it was almost free. 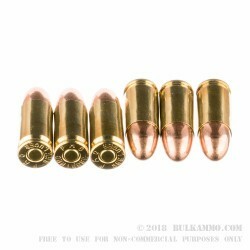 Perfect ammo for everyday range use!!! I have made many purchases from Bulkammo.com and as usual they sell the highest quality brands at the best prices anywhere. A: Hello! This ammunition is loaded with all new components. As a result, PMC ammunition is completely non-corrosive. Q: Are these Re-Loads or new casings ? A: Hello Michael, PMC ammunition is all new manufacture. They do not produce any reloaded ammunition. Q: Where is this ammo made? Q: What is the bullet casing made from? Copper or bimetalic? A: Hello Robert, These 115gr. FMJ rounds by PMC in 9mm have a lead core, copper jacket, and a brass case. They are non-magnetic and are safe to shoot on ranges that do not allow magnetic rounds. These make great target rounds in 9mm.